Now you can take it with you! 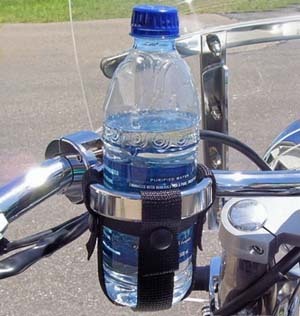 RRHD: This unique, top-of-the-line Drink Holder mounts to your H-D touring platform. 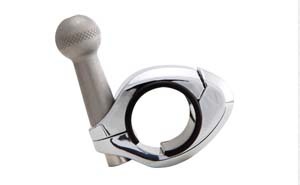 Secure the chrome plated billet clamp or bracket to the HD controls and slide the chrome cup holder ring in place. 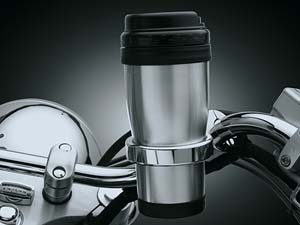 The multi-faceted lug on the ring makes it possible to position the cup vertically no matter the angle of the bars. Ships with our new mug. The new mug has double-wall construction so what's hot, stays hot, what's cold, stays cold. The one-click lid is easy to use and leak-proof. Easy installation. C3D-50: This new Cup Holder is a clean and classy way to always have a drink at your fingertips. 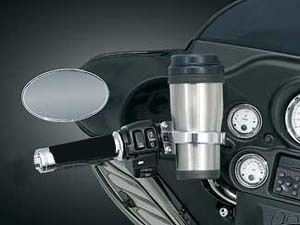 Utilizing the ball mounting system, you'll be able to pivot and adjust the stainless steel mug to the perfect position. 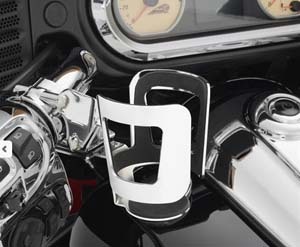 Available in chrome or black mounts for the handlebar, clutch or brake perch or mirror. 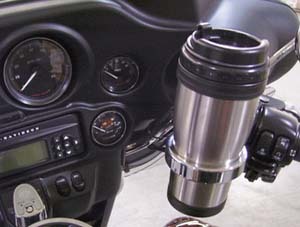 C3D-50L: Similar to above but with the larger cup holder. 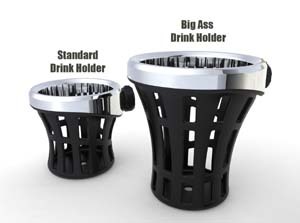 This Big AssTM Drink Holder is the perfect way to bring that 30 oz. tumbler on the road with you. The durable neoprene rubber molded net is designed to securely grip your cup so there's no worry of losing it. The rubber is also weatherproof and won't deteriorate in the sun or elements you encounter on the road. 50% larger than the standard size C3D-50. 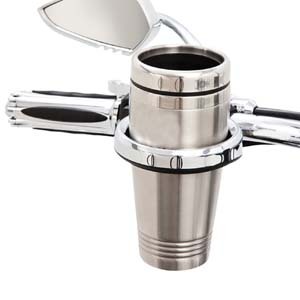 RR-35: The beverage holder conveniently holds most beverages in its tapered steel design. 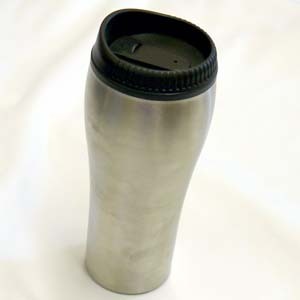 A rubber coated inside helps secure your beverage. 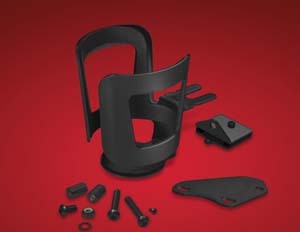 snap into a handlebar receiver that fits Harley face clamps. 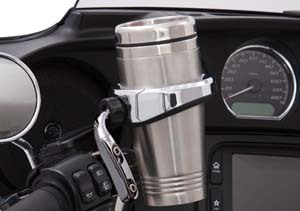 Once installed, the beverage holder easily snaps into the receiver mount for easy use. 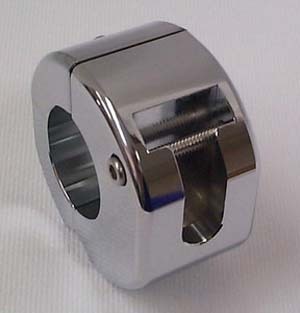 Fits all face clamps up to 32-401.5 mm on center. RR-35B: Similar but in satin black. RR-35I: Similar to above, fits Indian in chrome. RR-35IB: Similar to agove but in satin black. 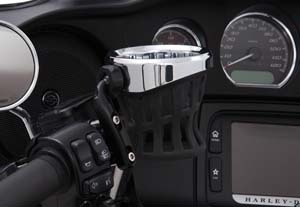 The below RR Type Drink Holders: This unique, top-of-the-line Drink Holder mounts on the handlebar or engine guard of your H-D touring platform. 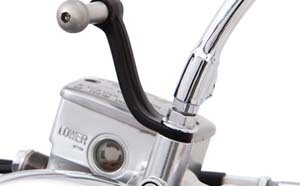 Secure the chrome plated billet clamp or bracket to the handlebar (or engine guard) or your HD controls and slide the chrome cup holder ring in place. 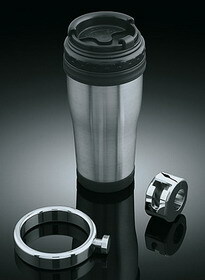 The multi-faceted lug on the ring makes it possible to position the cup vertically no matter the angle of the bars. Ships with our new mug. The new mug has double-wall construction so what's hot, stays hot, what's cold, stays cold. The one-click lid is easy to use and leak-proof. 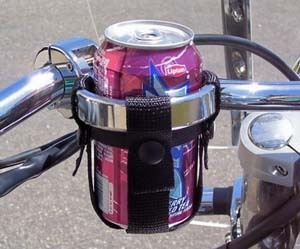 Add the RR22 can, bottle, coffee cup accessory. Easy installation. 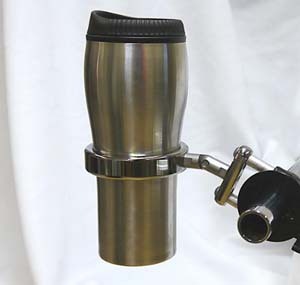 RRCH, RRBH: Now includes the Ultra-Swivel feature so you can adjust the ring to get your drink to sit straight no matter what angle the base bracket is attached! 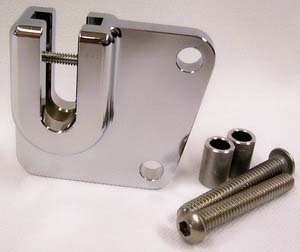 RRHD-B: Includes bracket, screws and spacers, as well as a slender allen screw that installs cross-wise after slipping the plate in. 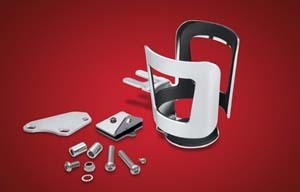 It can be mounted on either the RIGHT or the LEFT side. Available in chrome. 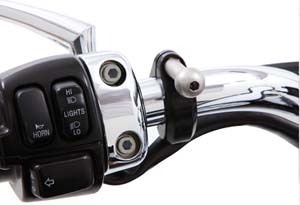 Fits Harley-Davidson handlebar switch housing/controls (screw spacing 1.5"). 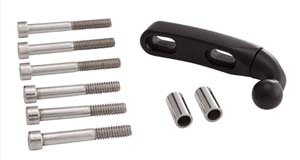 Note: Some Sportster 1200 models have a different thread pattern on the switch housing (you may need to purchase bolts directly from a Harley dealer). Fits either brake or clutch (left or right) side controls. 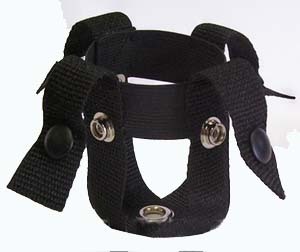 RRHB-B: Similar to above but in anodized black.